This book is written for technical architects and senior developers tasked with designing and leading the development of J2EE java applications. This book will guide the architect through the entire process of delivering a project from analysis through application deployment providing numerous tips, tricks, and "best practices" along the way. and project managers.” -- The Midwest Book Review (7/2/2004). 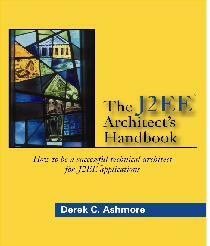 “The J2EE Architect's Handbook is a must have for experienced architects and budding designers alike. It is concise, to the point, and packed with real world code examples that reinforce each concept. Today's J2EE teams would do well to keep a copy at each designer's fingertips” -- Ross MacCharles, Lead Technical Architect. This book is written for technical architects and senior developers tasked with designing and leading the development of J2EE java applications. This book will guide the architect through the entire process of delivering a project from analysis through application deployment providing numerous tips, tricks, and “best practices” along the way. Design J2EE applications so that they are robust, extensible, and easy to maintain. Derek Ashmore is the managing consultant and CTO for Delta Vortex Technologies (dvt.com). He routinely provides consulting services for companies designing and developing commercial web applications. Derek has over 15 years experience and is currently focusing on Java, J2EE, and other internet-related technologies.